With the Tuckable IWB KYDEX Concealment Holster, you can completely conceal your gun with your shirt tucked in. Ambidextrous, hand molded, with adjustable Cant, this minimalist Tuckable Inside-The-Waistband (IWB) KYDEX Holster will protect your weapon from moisture while remaining extremely lightweight and durable. They are designed for every-day, all-day extended concealed carry. These holsters are comfortable and are very easy to hide, no matter how you are dressed, whether your shirt is tucked in or out. Fully adjustable for both Left or Right-Hand carry and you can position these holsters anywhere around your waist including Appendix Carry, Hip Carry, Back Carry, Cross Draw. Symmetrical mounting holes on both sides of the holster allow the belt clip to be mounted on either side of the holster and at either a standard or deep conceal ride height while allowing the cant (carry angle) to be adjusted anywhere from -15 to +15 degrees. The unique design makes the Tuckable IWB KYDEX Concealment Holster the slimmest tuckable IWB KYDEX Holster on the market. 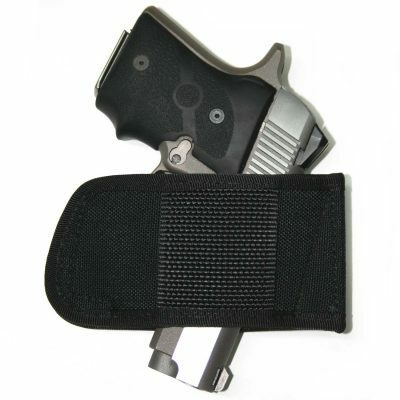 Comes with an injection molded polymer clip that fit up to 1½” belts to keep holster secured to belt. This thin clip offer an even smaller profile on the belt than conventional belt clips, and further increase concealability! Adjustable retention makes it easy to setup your holster just right for you. Only top-quality, USA made hardware is used, and all the screws are pre-dressed with threadlock, so they stay put no matter what. The design holds the gun very close to your body for maximum concealment. The Tuckable IWB KYDEX Concealment Holster is a quality holster designed for no-nonsense, practical everyday use. It is a versatile and one of the most comfortable methods of deep concealment available. FAST DRAW: Ambidextrous for Both Right & Left-Hand draw. Open top design offers a smooth, fast draw. FINEST MATERIALS: Hand-molded .08″ KYDEX with top-quality, USA made hardware. Fits most handguns such as Glock 17, 19, 26, 43, Sig Sauer, Beretta, Springfield, M&P Shield, Ruger LC9, Taurus, Kahr, Kimber, Kel Tec, Bersa, Walther, S&W, 380, 40 Auto, 38 special, 45 ACP, 357, 9mm, and many more.